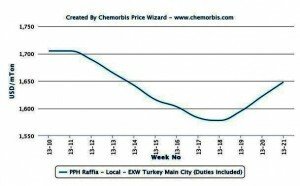 Local PP and PVC prices have been moving higher in Turkey’s distribution market since the second week of May as per the pricing service of ChemOrbis. Limited prompt supply is the main trigger behind these price increases in the local market, where the sentiment has also been boosted by the domestic producer’s consecutive price hikes. Petkim has made three price changes in 10 days, lifting its PP offers by $70/ton and PVC by $45/ton in total. In the PP market, concerns about diminishing local stocks were raised by distributors particularly in the second half of April. However, those concerns were not strong enough to reverse the market sentiment until the second week of May, when the PP market firmed up in China and supported sellers’ attempts to shift the market trend in Turkey. 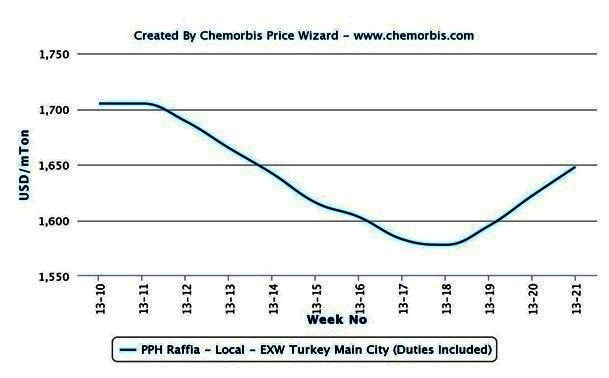 Over the past two weeks, the reversing market trend caused panic buying among Turkish distributors and since then, locally held raffia prices have gained approximately $70/ton on average, according to ChemOrbis Price Index. The lack of some nearby suppliers in the import market such as Egypt as well as the uncertainty about the delivery of Iranian cargoes contributed to the supply concerns, which was immediately followed by the withdrawal of many regular Middle Eastern suppliers from the market. This week, major PP producers and traders report good demand and limited availability, although one seller admits, “Most of the demand still comes from resellers, rather than converters.” There are also sellers holding onto their stocks in anticipation of seeing higher prices. “We have cargoes on the way, but we are not rushing to sell them,” noted several distributors. 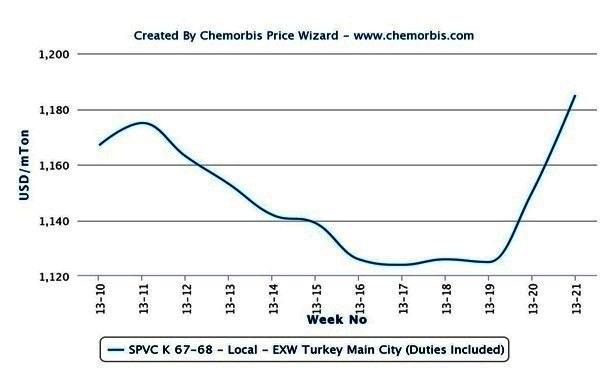 Since then, locally held PVC prices have gained $60/ton on average, according to ChemOrbis Price Index. Prompt Petkim materials as well as nearby cargoes from Iran and Egypt are seeing good interest these days in Turkey as a result of the ongoing supply issues. “I did sell a good amount of prompt material for PVC in less than 10 days and I am left with only a small amount of material,” said a trader.